Hyundai Asia Resources, Inc. (HARI), the official distributor of Hyundai vehicles in the Philippines, recorded 2,521 unit sales for the month of April, a feat considering there were fewer working days within said month. This pushed total January to April 2017 sales to 11,362 units, up by 9 percent as compared to the 10,417 units sold in the first four months of the previous year. Leading HARI’s impressive performance is the Passenger Cars (PC) segment, which grew by 10 percent from 7,073 units in January to April of 2016 to 7,753 units in the same period of 2017. 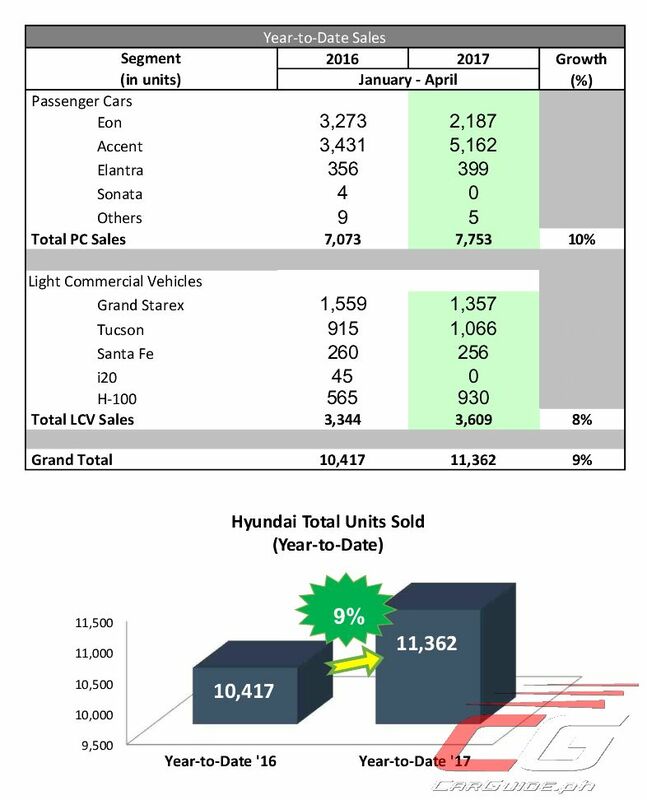 Driving the PC segment growth is the Hyundai Accent as it remains as the brand’s top-selling nameplate with 5,162 units sold in the first four months of 2017. The Light Commercial Vehicles (LCV) segment also showed remarkable performance as total January to April sales reached 3,609 units, an 8 percent rise from the previous year’s output. Faster than anticipated growth in this segment is buoyed by high acquisition of Tucson and H-100 models.